What is the Payload Capacity of the Chevrolet Silverado 2500HD? The payload capacity of a truck is the amount of weight the bed can safely carry while on the road or when traveling through San Antonio. The payload capacity is limited by the bed size, strength, and the support structure such as the springs and suspension system of the truck. 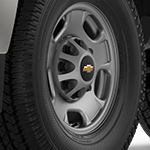 In the case of the Chevrolet Silverado 2500HD, the bed size is 79-inches in length, 51-inches in width measured between the wheel housings, and 21 inches in height as measured by the limitations of the height of the cab. Those measurements create a cargo space of 61 cubic feet. There is a further limit of weight which comes in at 4,212-pounds. If you are carrying your weight limit and having issues, then come to Jordan Motorcars San Antonio for a suspension inspection. Our certified technicians are aware of the intricacies of your suspension and how to make adjustments to carry the maximum payload.